Explicit hatred and overt racism continue to organise into a growing movement infiltrating the mainstream, becoming the mainstream narrative. Hate crime keeps rising; racist, homophobic and misogynistic rhetoric becomes more outrageous with every move by the Trump administration. It appears that the political and social climate keeps encouraging the worst of the worst, as new reports say white nationalist groups are recruiting on college campuses in the U.S. According to a report by the Anti-Defamation League, hate groups have been conducting “unprecedented outreach effort(s)” around universities. 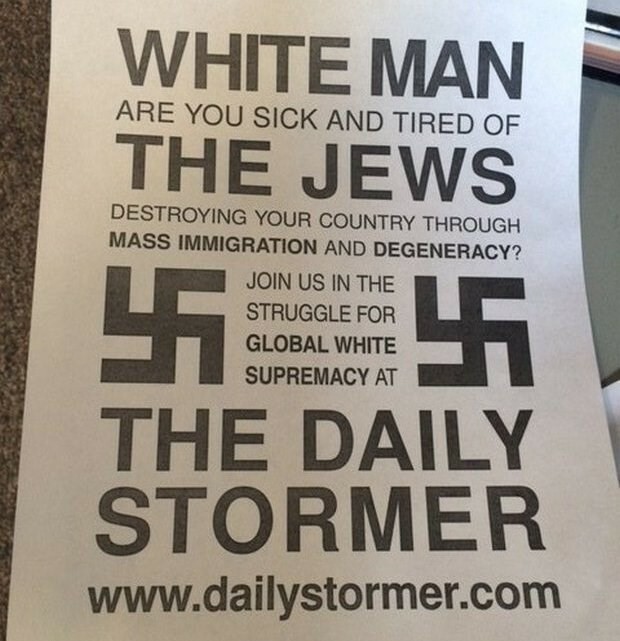 The organisation noted 104 incidents of white supremacist flyers showing up on campuses since the start of the academic year in September 2016. The ADL also confirmed there had been a surge in 2017, when the majority of incidents – 63 of them – took place. 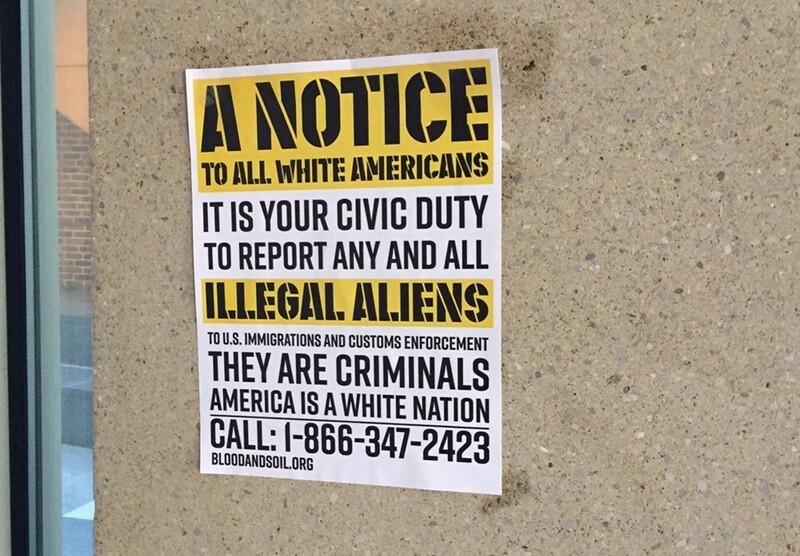 The reported attempts to recruit young people into the racist movement includes fliers and stickers from groups like Identity Evropa and American Vanguard – some read “Protect your heritage” and advocate ‘whites-only’ countries ruled by facism and Nazism. The Identity Evropa group, founded in 2016 and promoting white European identity, claims to have left their propaganda at around 30 colleges in the U.S, in what it calls ‘Project Seige’. Its founder, Nathan Damigo, held a ‘free speech’ event with alt right poster boy and punchable face Richard Spencer at Berkley last May. The American Vanguard’s website details their ‘Northern Propaganda Campaign’, where they focus on infiltrating issues surrounding U.S students to recruit them. They’ve managed to reach colleges included the University of Arkansas, the University of Central Florida, Emerson College, Massachusetts and more. Extremists groups like The Loyal White Knights, a North Carolina-based Klan group, has also put up pro-Nazi, anti-semetic and anti-Black Lives Matter posters around colleges in Chicago, Colorado and Boston. Back in February, an incident at the Central Michigan University saw disturbing Adolf Hitler Valentine’s Day cards circulating, which said: “my love 4 u burns like 6,000 jews”, referencing the Holocaust. At the University of Southern California, a vendor was asked to leave campus when they were discovered selling merchandise with swastikas. As the ADL rightly notes, this is all calculated and part of a widespread problem, as the alt right and extremist groups work to transplant online activism into the ‘real world’. Like Spencer, other figureheads of the movement have detailed their interest in encouraging younger people to join and keep their movement going. Prior to his fall from grace, former Breitbart editor Milo Yiannopoulos spoke on CNN about his campus speaking circuit: “I am speaking on college campuses because education… is really what matters. It’s a crucible where these bad ideas are formed. Bad ideas like… progressive social justice, feminists, Black Lives Matter…” Additionally, Jared Taylor, a prominent white supremacist said colleges were being targeted “because they are bastions of anti-white propaganda”. So why now? It seems like the racist groups have been attempting to infiltrate the university sphere sporadically for some time. Groups in Georgia State University and Towson University, Maryland attempted to establish ‘white student unions’ in 2013. In 2015, white supremacist networks targeted scholars who were working on race-related subjects. The University of Wisconsin also saw an attempt to create a branch of the American Freedom Party, a racist group that fully backed the Trump presidential campaign. Evidence arguably shows that Donald Trump’s triumph in the U.S elections has only encouraged more action. As Taylor wrote previously: “It is widely understood that the election of Donald Trump is a sign of rising white consciousness”, from which these groups can gain traction. Then there have been some rallies and protests at colleges including Michigan and Purdue. Spencer’s speech in Washington was met with major backlash, and Yiannopoulos’ event at Berkeley was cancelled after widespread rioting. Worryingly, Damigo told the Boston Globe that their campaigns seem to be wielding positive results. “We’ve discovered that there are many people who already have read our website, who already generally agree with us, but haven’t taken that next step to get involved or meet with other people,” he said.